Kerala girl Poorna entered the limelight as a classical dancer. She not only won many titles but was offered multiple movie roles on account of her breathtakingly expressive eyes. She dabbled in Malayalam cinema before debuting as a lead actress in Tamil, Telugu, and Kannada. Soon she became popular as the ‘horror queen’ of Tollywood with hits like Avunu and Raju Gari Gadhi. In Jayammu Nischayammu Raa though you will get to see the sweet side of her; she plays not just a human role in the film but also that of the perfect Kakinada girl-next-door. Tell us about your entry into films. In school I was awarded the Kalatilakam, which is a top honour from an annual event conducted by Kerala state government for school students. I also won a gold medal for ‘rollerskate bharatanatyam’ so even back when I was studying these things put me in the spotlight and I was offered cinema roles. At that time I did not take it up because I wanted to complete my studies. After a couple of years when I participated in the Super Dancer reality show, I simultaneously worked on my first film in Malayalam as Mohanlal’s daughter. Then I did a few more films in character roles before debuting as lead actress in the Tamil film Muniyandi Vilangial Moonramandu. Around the same time I did my Telugu debut Sri Mahalakshmi. Most people don’t remember it because it was Seema Tapakai that gave me a break in Telugu. Did you study acting before entering films? Do you think it is important to learn acting before entering films? I think the most important thing is dedication and hard work. These two things yield results. I always felt that my directors are my teachers. I listen to what they say because they are the only people who know what that character should look like on screen. Even when I work with new directors, I listen to them and mould myself accordingly. 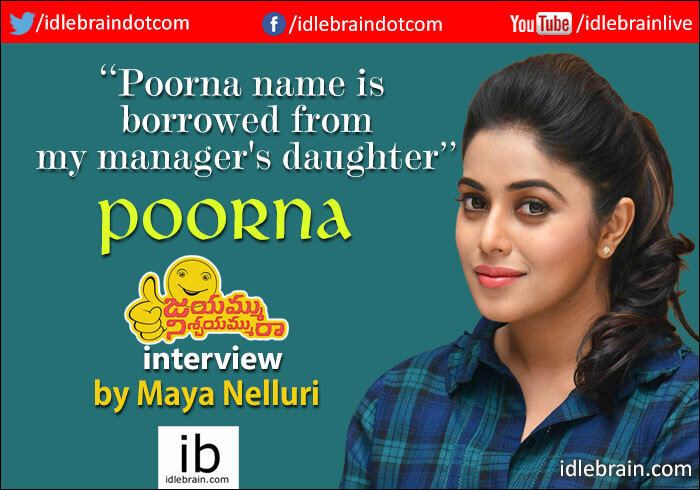 Why did you decide to change your screen name to Poorna from Shamna Kasim when you entered films? When I was making my Tamil debut they would always get my name mixed up and couldn’t say it properly. So I was looking for names which are simpler. At that time my manager just had a child and named her Poorna. I really liked that name and from when I thought of using that name things started working well so I stuck to it. It was also verified by numerology. Did you have any connections in the film world prior to your entry? No. I didn’t have anyone. In fact I’m the only person from my family to enter the film industry. It was a bit difficult because I did not know the ins and outs. That is one reason I started doing character roles. I did not know that to become a heroine you have to start with that. There was an actress Gopika during that time. Her parents were close to my parents and they advised not to let me do character roles because once you get typecast it is much more difficult to do lead. Still I can’t complain because we had managers. They do help us with the decision making but the decision is ours in the end. Sometimes what we think will work doesn’t work – it all depends on luck. How did your family react to your decision to enter films? I come from a very conservative Muslim family but that has never been a hurdle for me. My family has always been very supportive of me and my decisions. It was actually my mother who stood by me every step of the way and sent me to dance classes. I was the only Muslim girl in my village to learn classical dance. Then she also supported my decision to enter films. I have three older sisters and an older brother who are all very talented. But my mother took special interest in me. And when I got the film roles, my whole family was very happy for me. Has coming from a conservative Muslim family affected your career in any way? Sometimes it has, but mostly it hasn’t. For me the most important thing is my family. They support me and I respect their requests. I ask my mother about everything and if she says it’s ok and it doesn’t hurt my father or siblings, I do it. Still, people say things if I wear short clothes or even wear a bindi. People ask ‘aren’t you a Muslim?’ Just because I wore a bindi for a character that doesn’t mean that I’m not Muslim! Were there any particular instances that your family also did not approve of? There was a lip-lock scene in Seema Tapakai movie which my brother was a little upset about. It was mainly because he is working in Saudi. He has many friends there and I can only imagine they must’ve commented about it. It is much like if someone says something negative about your children; it is difficult to hear. I am like a child to my siblings. Apart from Seema Tapakai, you’ve worked with Allari Naresh in other films, how was that experience? He is a very good co-actor and does amazing comedy films. I’ve always had a good experience. At the same time I have been comfortable working with all my heros. Your next Telugu film after Seema Tapakai was Avunu, and it seems like since then you’ve been concentrating on horror films. It’s nothing like that. I actually don’t even watch horror films because I’m so afraid. When I got the offer for Avunu, Ravi Babu told me that he really liked my eyes and he needed expressive eyes for the film. People often tell me that I can express and emote very quickly and I think my dance background really helped me here. As for choosing the script, I did not even know the entire story of Avunu before I started shooting. He would only tell us the script for the day on the day. While I was shooting it I used to go back to my room and sit there scared whenever the wind blew or the curtain moved (she laughs). Still I’m very happy that all my horror films became hits. Do you have any dream roles? I want to work in films where the actor and actress have equal importance. I don’t want to do a scene just before a song and then go of screen. I want to work on something that when I see the film I should feel that ‘yes I did a good job’. I should feel satisfied with my work. It would be great if I got to work with superstars but that doesn’t always happen. I just want to do good films. I don’t want to continue acting forever but for however long I do stay, I want to work in good films. Speaking of superstars, you danced alongside Mahesh Babu in Srimanthudu – what was your reaction when you got the offer? I really like Mahesh Babu. I like his acting and think he is the perfect chocolate boy. When I got the offer for the song I just asked one question – ‘is it ultra glamorous/ does it have a lot of exposing?’ They started to say that it is ‘traditional’ but even before they could finish the word I said I’ll do it (she laughs). I don’t think that there is anything wrong with item songs but I don’t think that my dance is suited to them. The song worked great for me because even though I wasn’t on screen for very long everyone was talking about it. Also the song was a super hit and I was part of it so I was very happy! Coming to your release Jayammu Nischayammu Raa – can you tell us about your role? My character Rani is very different to the ones I’ve done earlier. She is also nothing like the real me because I am very bubbly and talkative. Rani is a quite, sweet, girl-next-door who loves flowers and is passionate about them. The character resembles my mother and sister more than me (she laughs). In the film I play a typical Kakinada girl. If you see Kakinada girls they are all very beautiful with no makeup and long hair – they are very classic; just like the love story in this film. The love story here is not from this generation. It is quite different to what you would have seen on screen in recent times. When I watched the film, in some scenes I felt surreal. I was thinking ‘when did I do this?’ I had the same feeling when I watched Avunu so it is definitely a good sign. You only get that feeling because the best directors bring out something in us that even we don’t know exists. In this case, much of the credit for the film goes to the director because he is extremely talented. What can we expect from the film? I think the locations in the film are out of this world. They give an old world feeling that earlier films had. They have a kind of warmth that will stay with the audiences. I also think that all girls should watch this film because the events Rani goes through and decisions she has to make come up in most girl’s lives at some point. I think they will really identify with it. What other films are you working on now? I’ve just about finished Avantika and Raakshasi in Telugu which are both horror films. I will be starting a new film on Monday where even Hindi actress Rekha is present. The name of the film is not yet finalised. In Tamil I have two more in the pipeline and I’m starting another film in December where I will be playing Aravind Swamy’s wife. Trisha will also star in the film.